Microsoft scientists are creating a better mosquito trap and hitching it to a drone in order to catch the pesky insects and study them for early signs of potentially harmful diseases. Long term, the company hopes that early detection will help prevent epidemics and give the medical community more lead time to prepare for them. Specifically, what Microsoft scientists are trying to do is build a better mosquito trap than those currently available. Current traps were designed in the 1950s and 1960s and are notorious for being expensive to maintain. They involve chemicals and batteries, are cumbersome and indiscriminately collect insects, leading to hours spent in the lab sorting out the mosquitos. Microsoft’s new trap uses less energy by relying on lighter batteries, and a sensor bait system that specifically picks out and preserves mosquitos. 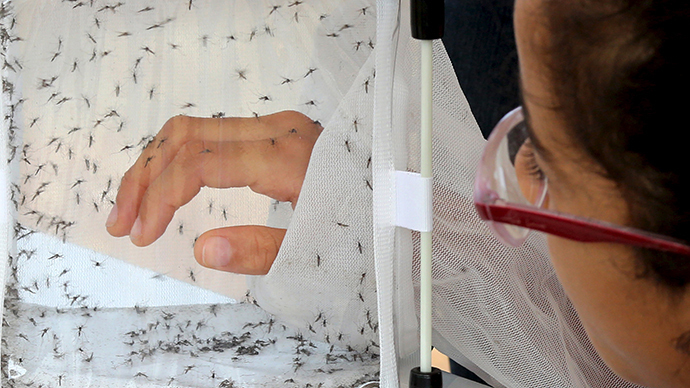 If successful, it could save countless hours of lab work by filtering mosquitoes from other insects as it operates. A drone will fly the traps into and out of remote areas, eliminating the need for teams to be sent in repeatedly to maintain and collect the traps. The initiative has been dubbed “Project Premonition” and will involve Microsoft collaborating with academic partners across multiple disciplines. The initial work will be announced at a tech fair in Washington, DC on Wednesday. Researchers say the project will take several years to complete and will require autonomous drones, cutting-edge molecular biology and advanced cloud-based data analysis. In addition to the better trap and drone, the project will use advances in molecular biology and genetic sequencing to help improve screening for multiple viruses, including ones that haven’t been discovered. The data will be stored on cloud-based databases with algorithms for evaluating which viruses could present a threat to humans or animals that humans rely on. Jackson said five years ago, the cost of such a system would have been prohibitive. Microsoft researchers say Project Premonition could eventually allow health officials to get a head start on preventing outbreaks of diseases like dengue fever or avian flu before they occur. Oftentimes, health officials don’t find out about an outbreak until people are already getting sick, as in the recent outbreaks of Ebola and MERS. It often takes months before health clinics are up and running, and developing a vaccine requires months, or even years, of work.